Tired of losing sales because your catalogs and brochures arrived at your customer's homes damaged from mishandling or exposure to rain and snow? Now you can ensure the safe delivery of your valuable materials with our clear view poly mailing envelopes. Our poly mailing envelopes are perfect for mailing your catalogs or brochures to your customers and clients. Each 3 mil thick envelope is self-sealing and double perforated for ease in opening once they get to their destination. While the front of the bag is clear so the contents are visible, the back is opaque to allow for printing of addresses and other information. The envelopes come in two sizes, and are available in case quantities. Why risk your catalog or brochure to damage from handling while in transit or from the elements once it's delivered? 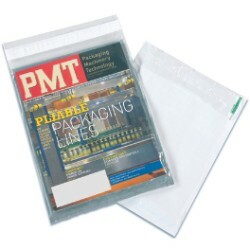 Make sure your materials get delivered in pristine condition with our clear view poly mailing envelopes. You - and your customers - will appreciate them!